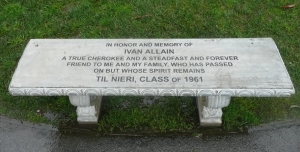 Engraved concrete bench that will be placed near the monument naming the honoree and donor. Please allow a space for word breaks and periods. Please print and indicate capital and lower case letters with a maximum of 20 characters per line. YOU MAY HONOR ANYONE YOU WISH ON THE DEDICATION STONE/TREE OR BENCH, WHETHER OR NOT THEY SERVED IN THE MILITARY.